Celadon Ceramic Figurines from Thailand (pair), "Little Light Green Owls"
Owls with wide eyes inspire these figurines by Duangkamol. Crafted by hand of celadon ceramic, the wise little birds flaunt exotic light green feathers. 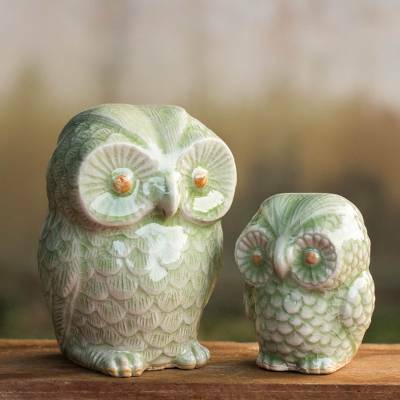 You can find celadon ceramic figurines 'Little Light Green Owls' (pair) by Duangkamol in sculpture categories such as Celadon Sculpture, Animal Themed Sculpture and Ceramic Sculpture. Enjoy exploring these sections for other Novica treasures.